I’ve had robins on the brain lately. It must be my impatience for spring because I’m definitely not a bird lover. But there is something about robins that I enjoy. The robins that hang around in Washington don’t look like this fellow (at least not the ones I’ve seen). They are bigger, less “puff ball” shaped, and have a deeper red breast. I have to say I like this little guy better. I found him on flickr and I think he might have been photographed in Ireland. 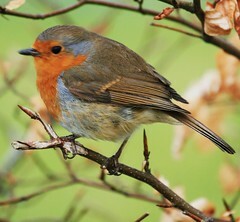 So I’m keeping my eye out for signs of life and hoping some robins make their way to my yard. I’m planning on bringing some robin designs inside too, either with embroidery or photo transfers – something crafty, which hasn’t jelled in my mind yet. Next time I’m at the store, I’ll find some of those blue-shelled malted balls that are already on the shelves for Easter and make some of these Robin’s Egg cookies. Yep, definitely have some bird on the brain.